To date, in eukaryotes, ribosomal protein expression is known to be regulated at the transcriptional and/or translational levels. But other forms of regulation may be possible. Here, we report the successful tagging of functional ribosomal particles with a S7-GFP chimaeric protein, making it possible to observe in vivo ribosome dynamics in the filamentous fungus Podospora anserina. Microscopic observations revealed a novel kind of ribosomal protein regulation during the passage between cell growth and stationary phases, with a transient accumulation of ribosomal proteins and/or ribosome subunits in the nucleus, possibly the nucleolus, being observed at the beginning of stationary phase. Nuclear sequestration can be another level of ribosomal protein regulation in eukaryotic cells.This may contribute to the regulation of cell growth and division. Because translation utilizes a large proportion of the cell energy, its components are tightly regulated, especially ribosomes. Indeed, as cells are depleted of nutrients, a reduction in ribosome function occurs. In E. coli, ribosomes are converted by dimerization through the action of the RMF protein into 100S particles that are unable to perform translation . In eukaryotes, ribosomal proteins are down regulated. This occurs through transcriptional regulation in yeast  and mostly through translational regulation in mammals and Dictyostelium . To date, in vivo observation of a tagged and functional ribosomal particle during various cellular growth phases has not been reported (despite the fact that the large ribosomal subunit has recently been successfully tagged with GFP ), so there has been no evidence of whether spatial regulation can also be involved in the regulation of ribosomal proteins. Here, we report a spatial regulation of a small subunit ribosomal protein upon entrance into stationary phase. In order to observe the ribosomes in vivo, the S7 small subunit ribosomal protein of P. anserina was tagged with GFP. S7 belongs to the E. coli S4 family and is encoded by the su12 gene . To this end, the GFP coding sequence was inserted in frame in the place of the su12 stop codon to yield the su12-GFP gene. Expression of this gene is thus driven from the su12 promoter and should yield a chimaeric S7GFP protein composed of S7 at the N terminus of the protein and GFP at the C terminus. The su12-GFP gene was introduced by transformation in the su12-1C1 mutant strain, which carries two mutations in the su12 gene, and thus displays a strong decrease of paromomycin resistance ; this antibiotic binds to ribosomes and increases the decoding error rate [7, 8]. The transformants obtained were fluorescent and had the same level of paromomycin resistance as wild type (Fig. 1) indicating that the S7GFP protein is incorporated into the ribosome and is fully able to replace the su12-1C1 mutant protein during protein synthesis. Genetic analysis for two transformants showed a complete co-segregation of the restoration of paromomycin resistance and of the fluorescence. Functional complementation the su12-1C1 mutation by su12-GFP. 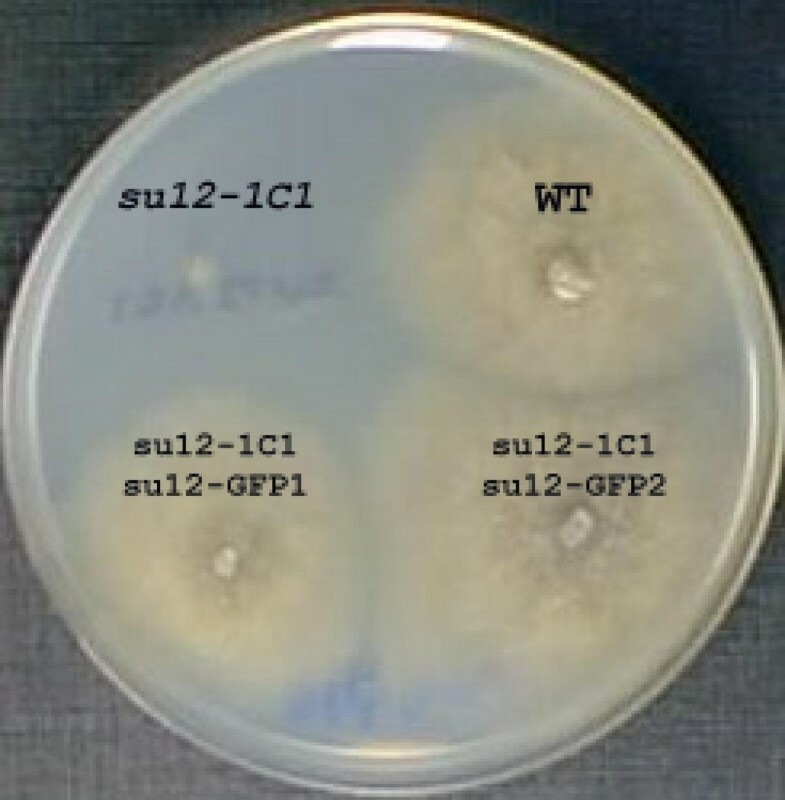 Growth after four days on medium containing 750 mg/l paromomycin of two independent su12-1C1 transformants expressing the S7GFP protein, wild type and untransformed su12-1C1 strain. As seen in Fig. 2A and 2B, examination of hyphae taken from the growing edge of a culture revealed an intense fluorescence throughout the cytoplasm of most hyphae. The staining heterogeneity was due to the fact that organelles and vacuoles remained unstained. By contrast, examination of hyphae taken about 1 centimetre away from the growing edge, where cells have stopped their division for about 24 hours, revealed in many (but not all) of them a less intense fluorescence that was homogenous throughout the cytoplasm but for a few intense foci (Fig. 2C). These foci co-localised with nuclei (Fig. 2D). They were not observed in the control experiment where GFP was expressed alone from a GPD promoter (Fig. 2G and 2H). When cells had stopped their division for a longer time (i.e. for about a week), the fluorescence decreased further and no foci were observed (Fig. 2E and 2F). These in vivo data show that the ribosomes are diminished in the cytoplasm upon entrance into stationary phase but also provide evidence that the S7 protein is present during a transient period at a higher level within a define region of the nucleus. The staining is possibly localised in the nucleolus, since in 42 out of 50 nuclei observed, the foci were located at the periphery of the nucleus in a region that appeared less stained with DAPI (Fig. 2I, J and K). In the remaining 8 cases, the nuclei exhibited the shape of a pear and the foci were localised at the tip of the pear. In these cases, it was impossible to ascertain that the foci were located within the nucleolus. Microscopic observation of hyphae expressing the S7GFP protein. A-F, are experimental observations with strains carrying the su12-GFP chimaeric gene. 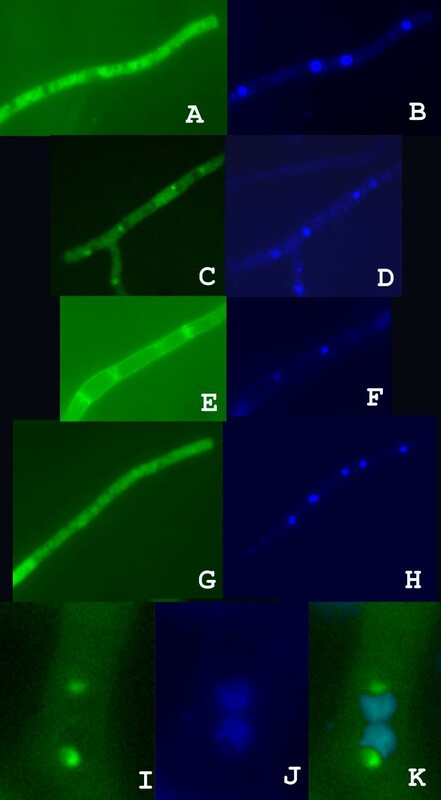 A, C and E visualise GFP fluorescence and B, D and F visualise DAPI straining. The hyphae in A and B is from the growing edge; The hyphae in C and D is taken 1 centimetre away from the growing edge corresponding to about 1 day of stationary phase. The hyphae in E and F is taken 5 centimetres away from the growing edge corresponding to about 1 week of stationary phase. The picture in E was taken with a pose time twice as long as the other pictures. G (GFP fluorescence) and H (DAPI staining) are control observations of GFP alone expressed from the GPD promoter; the hyphae is taken 1 centimetre away from the growing edge as in C and D. I (GFP fluorescence), J (DAPI staining) and K (superposition of I and J) show the sub-nuclear localisation of the foci in two adjacent nuclei. Clearly, the GFP foci are located in a depression of the DAPI staining, where the nucleolus is supposed to be located. We report here for the first time a nuclear sequestration of a ribosomal protein during a transient period at the onset of stationary phase. A plausible explanation is that this kind of regulation permits a rapid production of ribosomes if nutrients are encountered before a more pronounced stationary phase is entered. However, recent data [9, 10] show that release of cdc14, sequestered in the nucleolus, is involved in the proper exit from mitosis. Because ribosomes might regulate cell cycle progression , it is possible that sequestering ribosome in the nucleus is an additional level of regulation involved in ensuring a correct cell cycle arrest. The strains used for this study derive from the S strain . Culture and methods used for Podospora anserina are described in . DNA manipulation were made according to . To construct the su12-GFP gene, the su12 coding sequence was amplified from plasmid psu12-S3  by PCR with oligos 3382 (5'-ACTATAGGGCGAATTGG-3') and su12-3' (5'-CGGGATCCCGAAAACATACCTGATCACGCAGAG-3'). This yielded a PCR product, in which the su12 stop codon is replaced by a Bam HI site allowing for the fusion with the GFP coding sequence. To this end, the PCR product was digested by Eco RI and Bam HI and cloned into pEGFP-1 (Clontech) at the corresponding sites. The sequence of the complete su12 coding sequence along with the junction with the GFP coding sequence revealed that no mutation had occur in the su12 coding sequence during plasmid construction. Podospora S strain was co-transformed using the method of  by this plasmid and pBC-hygro vector . Transformants resistant to hygromycin were selected and examined for GFP fluorescence and resistance to paromomycin. Several such transformants were obtained. Two were subjected to genetic analysis through a cross with wild type. We would like to thank all members of the laboratory for useful discussion and Denise Zickler and Françoise James for helping with the microscope. This work was supported by ARC grant n° 5388.